To celebrate five years of NT100 we’ve revisited Open Bionics to understand what’s helped the initiative grow, since it featured in our 2015 NT100. Tilly Lockey, a bubbly 11-year-old from Durham, is wearing what looks like a superhero robot arm from a Hollywood film. She is picking up objects, holding onto them tightly, and experimenting with making the ‘o’ shape with her thumb and forefinger. “Squeeze your muscles to close it, flex your muscles to open it,” she says triumphantly. She’s only had the arm on for a few minutes, but she’s already an expert at controlling it. Tilly, who lost both her hands to meningitis when she was a baby, is one of four children – all under 12 and with missing limbs – taking part in an NHS trial to test the feasibility of providing bionic prosthetics through the NHS across the UK. The trial ends soon. Tilly has been wearing her superhero prosthetic in real situations, and so far she is pretty happy with it. “Instead of people thinking they feel sorry for you, because you don’t have a hand, they’re like; ‘oh my gosh, that’s a cool hand!’,” she told the BBC. Tilly is one of an estimated 10 million amputees worldwide who have lost one or more of their limbs due to septicaemia, trauma, war, or diabetes. Many, like Tilly, have lost a limb at a young age. Others experience amputation as a result of army service, other trauma, or type II diabetes later in life. Amputees can be fitted with prosthetics, but these are either very basic, with a simple hook at the end, or very expensive – a bionic limb can cost £80,000. Currently, the NHS provides only two kinds of flesh-coloured prosthetics with no movement, and waiting times can extend for months. But this could soon change. The superhero bionic arm Tilly was trying out was made by Bristol-based robotics startup Open Bionics, founded by engineer Joel Gibbard and journalist Sammy Payne. Gibbard had been working on low-cost prosthetics while studying for a robotics degree at the University of Plymouth. When Payne interviewed him for a media story, she was so inspired by his dream to make open source robotic hands for amputees, that she joined him to make it a reality. The pair established Open Bionics in 2014, and have spent the past three years developing a working prototype that they can take to market, improving efficiencies and costs as they go along. They are now able to produce a tailor-made bionic limb that costs just £3,000, thanks to 3D printing. First, an amputee is scanned using a 3D scanner, which only takes a few minutes. Then, a limb and socket with just the right fit are printed using a 3D printer, which currently takes about two days. The pieces are then assembled and fitted. The robotic hand responds to sensors that pick up muscle movements from the skin of the wearer, who can tense or flex their muscles to close and open the hand. Sensors in the fingers let the amputee know how much force is being used, so they can practise and eventually master controlling their device. Unlike traditional flesh-coloured prosthetics, which can look unsightly and are designed to mask an amputation, Open Bionics prosthetics are stylish, colourful, and draw attention to the wearer in a positive way. Payne says that this is exactly what amputees wanted. Daniel Melville, 26, who was born without a hand, became one of Open Bionics’ first testers. Although he had a prosthetic while growing up, he told Payne and Gibbard that this made him feel even more disabled, and urged them to make their prosthetics anything but flesh-coloured. “You might as well stand out for all the right reasons,” Melville told Buzzfeed this year. Testing a robotic hand was a revelation to him. “You don’t get people saying ‘What happened to your hand?’ – it’s more like ‘Wow, that's amazing. How does it work? What does it do?’,” he continued. Open Bionics has worked with Disney’s Tech Accelerator Program in Los Angeles, developing a number of superhero-themed bionic hands for children. Disney now allows the startup to use its copyright for free. The team has produced an Iron Man arm, a lightsaber Star Wars arm, and one adorned with snowflakes, inspired by Disney’s Frozen. Once the NHS trial is completed, Open Bionics can apply for a further £1 million grant that would enable it to roll out its bionic prosthetics across all NHS clinics. The move would make prosthetics more affordable, while significantly shortening waiting times. 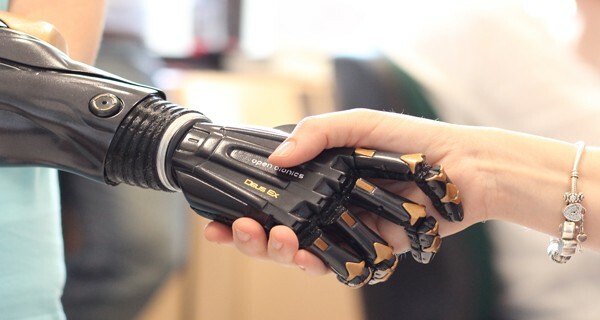 The company currently offers a number of products through its website that enable consumers to build their own prosthetics using open source code, as well as the Brunel Hand, a fully articulated robot hand suitable for research or building humanoid robots. A fully bionic arm will be available to both UK and international markets in 2018. While Open Bionics relies on future revenue from its consumer products, the company intends to keep its code open source. Payne sees both the commercial and the social impact benefit in doing so. “When you’re open source you open your technology to millions of other people who want to take our work and develop it. The value we get out of it is much higher than any threat to business,” she says. Taylor, a US war veteran, who lost all four of his limbs in Afghanistan, became the world’s first wounded soldier to wear a 3D-printed bionic hand, when his friend Neal, an engineer, printed it for him, based on Open Bionics code. “This was always the goal, to release my designs and have incredible engineers like Neal take them and adapt them for their own purposes and to help someone else,” Gibbard said at the time. “It’s great that Neal is sharing his designs and ideas too. This is the fastest way to creating better prosthetics,” he added. Creating a lightweight, affordable, highly functional prosthetic that’s also stylish has been no mean feat. One of the biggest challenges was the cost, which is where 3D printing has proven invaluable. “Desktop 3D printers are becoming easier to find in maker labs and schools, and 3D printing materials are cheap,” Payne explains. Open Bionics ultimately wants to change the status quo of the prosthetics industry so that bulky, embarrassing and expensive prosthetics are replaced by attractive, lightweight and affordable bionic limbs that give amputees new options to live life to the fullest. One day soon, amputees may not only be able to tie their hair back easily, but set the trends in their communities.